Life, On A Bridged: Providence River Bridge -- at night! 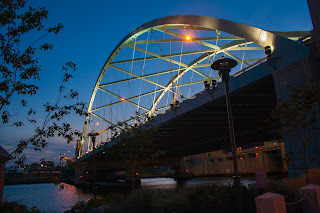 Providence River Bridge -- at night! My car tires were about to dissolve into the road unless I got them replaced, so until I could save up enough money for a new set, I haven't been going much of anywhere for the last month or so. But a dear friend was flying from Texas to Rhode Island for a conference, and I wasn't going to get to Providence on a bicycle. After dinner, I was able to coerce him to come with me bridge hunting. I've taken pictures of the Providence River Bridge before, but... never at night. 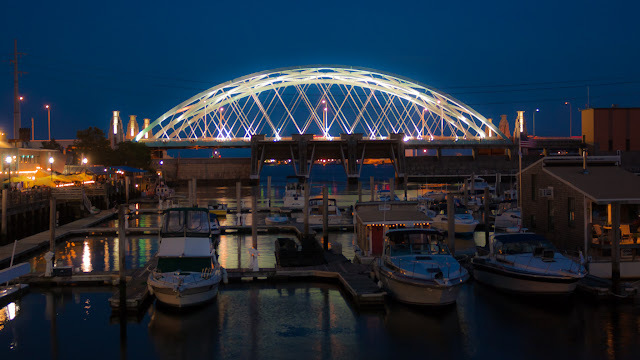 Lit up, the bridge sparkles like a jewel on Providence's waterfront. It's so bright that local astronomers insisted it be turned off at 11PM so that the stars could be seen. The Providence River Bridge, the widest network lattice arch bridge in the world, was built at a warehouse about fifteen miles down Narragansett Bay and transported up-river to its current spot. This move was the subject of the History Channel documentary, "Mega Movers: Really Big Bridges". Since I last wrote of this bridge in July, I've had a chance to watch this documentary. It's pretty incredible. To move the bridge, they first had to construct four giant winches to lift the bridge onto specially constructed trucks with over a hundred wheels between them, that, incredibly slowly, inched the bridge onto two barges that were connected by steel bracing. These barges were then pushed by tugboats up the bay to Providence. Any misalignment would send the bridge into the bay. Total professionals they were; the bridge made it without incident. I inspected this bridge a few years just before the westbound lanes were opened. The bridge deflects a few inches when trucks drive over it.